What small amount of credibility you have left reached its absolute nadir with your article in this mornings Times ("Hiring Torre would be all right..."). The violins couldn't play loud enough for the departure of Grady Little, a totally incompetent manager and the root cause of the Dodgers nuclear winter. The fact that his malicious treatment was the focus of your perspective, rather than the Hosannas that should be ringing out from your pen for the coming of Torre and possible salvation of a moribund franchise, shows that you are grotesquely out of touch with the city of Los Angeles, LA Times readers, and most importantly, fans of the Dodgers. "Little is a good man who deserves better". I have no doubt that Grady Little is a good man, and he certainly does deserve better. But better than the fans of the Dodgers, who have had to endure two years of this mindless dimwit, a numskull who completely lost control of the team and made incomprehensible blunder after blunder past the 6th inning? It is they who are being asked to endure more years of team poverty. And your maligning of Juan Pierre, the one player who fulfilled all that was asked of him and far more than he should have, is comical. He was saddled with hitting in the number two hole behind a vomitous lead-off hitter in Furcal, the worst in the league. His numbers were totally consistent with what he came here to do. What planet are you living on? Should the focus be on Colletti now? Yes, without question. He needs to address several key areas, including a franchise type hitter and ace. But to base the bulk of your breaking news story on the wrongs McCourt has done to Little as opposed to the Christmas gift he has given us is just plain hooey. (I can't believe I just wrote that line). In the immortal words of the Firesign Theater, "I say live it or live with it". October 29, 2007 -- If divorce proceedings between Grady Little and the Dodgers go the distance, as many expect, The Post has learned Joe Torre has been targeted as the manager to heal a fractured Los Angeles clubhouse. 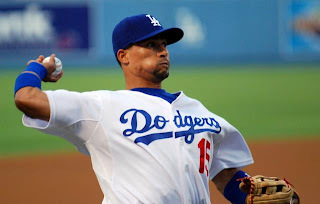 According to two people with knowledge of the Dodgers' universe, the club and Little are talking about a buyout that would leave the manager's office in Chavez Ravine vacant for Torre to inherit. 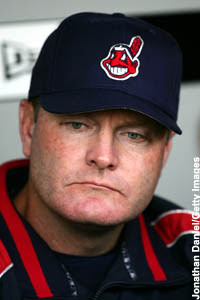 Torre, who wants to manage again, is interested in talking to the Dodgers if the job becomes available. Since none of Little's coaches is signed for next year and he is ($1 million and an undisclosed option for 2009), there has been speculation Little is out. And since the underachieving Dodgers have a dysfunctional clubhouse with veterans and youngsters feuding, Torre is the ideal person to put the room back together. Last week it was reported the Dodgers offered Joe Girardi a job - either as bench coach to replace Dave Jauss, who is a candidate for the Pirates' managing gig, or to take over for Little. When Girardi supposedly turned the Dodgers down, many took that as a sign Girardi is in line to succeed Torre in The Bronx. According to several people, the Dodgers inquired about Torre's interest before he rejected a one-year deal for $5 million with a chance to earn $3 million in incentives and stay with the Yankees. If Torre replaces Little, it will be a popular move based on the reception Torre received at an Elton John concert in Las Vegas Saturday night. John introduced Billie Jean King and Torre from the stage. The crowd at The Colosseum At Caesars Palace gave Torre a standing ovation and the Dodger fans on hand serenaded Torre with “Come coach L.A."
“Knowing [Dodger owner] Frank McCourt, it could be real," a baseball executive said of the Dodgers' fascination with Torre. While it would cost considerably more money to land Torre ($12 million for three years?) than keep Little, the Dodgers need to retake the L.A. market. The Angels are a much better team, and owner Arte Moreno has successfully marketed his club as an L.A. brand despite playing in Anaheim. The hiring of Torre, a former Angels broadcaster with a fondness for Southern California, would go a long way in giving the Dodgers star power that is required in a star-driven town. 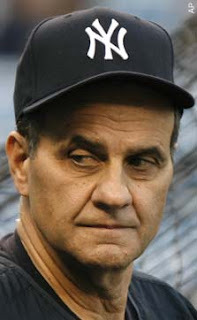 Should the move be made, Torre could raid the Yankees' for his coaching staff, since none is under contract past Wednesday. Texas has an interest in hitting coach Kevin Long. Field coordinator Rob Thomson has drawn interest as a bench coach or base coach. Dodger hitting coach Bill Mueller, who replaced Eddie Murray during the season, is likely headed back to the front office. That would open a spot for Long, who Torre believes did an outstanding job in his initial season in the The Bronx this past year. As a life long Dodger fan, and the recent recipient of an Indian's castoff by the name of Grady Little, I can only say that Eric Wedge nicely fits the mold of the Hargrove/Manuel/Little/Wedge quartet of managerial blunder pusses. He was completely exposed during this ménage a trios of games that solidified the Tribes place in epic loser lore. The horror for any team that has the epigram "fear" as its mascot and leader. Looking into that dugout the last three games and watching Wedge disintegrate, I was reminded of what I have had to watch day after day from Little and his co-horts in LA. Particularly Rich "Skinner" Donnelly, who would either send player after player to his untimely demise, or freeze like a deer in the headlights, shooting up his paws to stop the terrible possibility of being wrong. Fear is indeed the enemy, and it is us. I have great sympathy for the mistake by the lake. At least you were there, the candle clearly in your grasp. We in Little land had to endure the nightmarish ness of a season of this blue-print, obviously straight outta' Cleveland. Recipe for disaster: Add Lofton and shake well. Five times now a game seven bad luck charm after leading 3 games to never. And my dear friend Evan has still not recovered from Edgar Renteria. Someone help him, please!!!!! 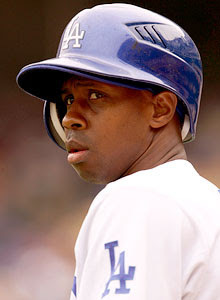 I am rather flummoxed by the negative perception of Juan Pierre and his debut as a Dodger in '07. His numbers were status quo, which is above average for other players in the league. Had he not been relegated to the number two slot in the hitting order, I suspect his overall numbers would have been even better. Beyond that, I feel that had he and Furcal swapped hitting order, the Dodgers would have fared considerably better as a team. Pierre is among the very best leadoff hitters in the game and the "Castillo/Pierre" model that Little was hoping for from Furcal/Pierre did not pan out. If anyone should be the subject of discontent as far as the Pierre signing is concerned, that onus should be on Colletti, not on Pierre. Rafael Furcal, on the other hand, was an unmitigated disaster. His injury notwithstanding, he was statistically the worst shortstop defensively in baseball and his offense putrid. I have doubts about his rebound in '08 and would like to see him traded post haste. The perception which gives Furcal a free pass is that he appears to be playing harder than Pierre, who somehow is perceived as a malingerer. This could not be farther from the truth. I am disturbed at the considerable degradation Pierre receives from fans of the team. It is not supportable to me and wreaks of something far more foul, which we know that Dodgers and their fans have been guilty of over the decades. Where have you gone Jackie Robinson? Here are some stats that boggle the mind regarding the Colorado Rockies over their ridiculous 20 of 21 game win streak. In those 21 games, they have had 12 different players with the go ahead RBI. 11 of their wins have been by 2 runs or less. 10 different pitchers have been credited with wins. 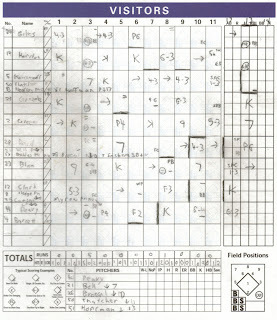 8 times the winning run was hit in the 8Th inning or later. They have 3 extra inning wins. They have allowed the Diamondbacks to score only 4 runs in the NLCS, and that comes on the heels of allowing the mighty and vaunted Phillie's lineup 3 runs, only one of them earned, in their three game sweep in the LDS. As a team the Rockies are hitting only around .230 in the NLCS, which is even more scary as they are winning in the traditional manner of great pitching, astonishing team defense and timely hitting with RISP. As far as their defense, well they look like the Harlem Globetrotters out there. They finished the regular season with the highest team defense in the history of the game!!. Combine that with the best team hitting average in the National League this year and you can see that this is one of the biggest sports stories ever. If the Rockies win tonight and move onto the World Series, they will have 9 days off. If you recall,last year the Detroit Tigers had 8 days off before they played the super hot St. Louis Cardinals and lost in 5 games. We will see if this super red hot run of the Rockies loses momentum. I for one do not think it will matter. That's because I actually don't think the Rockies are hot at all. I think they are great. I happened by accident (is there ever an accident?) to have the Soundscapes channel on my digital cable and one of the most beautiful pieces of music I have heard in years played. 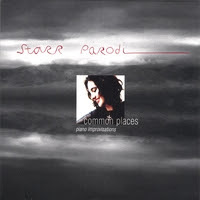 The song was called "Common Places" by an artist named Starr Parodi from the CD of the same name. I was instantly moved beyond words. In the past few months I have heard three musical statements that have touched my soul deeply: Mychael Danna's soundtrack to the film "Water", Maneesh De Moor's CD "Sadhana" with the incredibly haunting piano piece "Pure Essence", and as of tonight Starr Parodi's "Common Places". 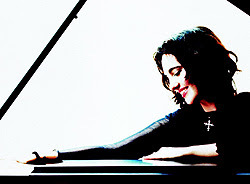 The emotion in Starr's playing reminds me of the depth of my late mother Barbara's piano playing. Memories of those I have loved and lost pour into me and I am touched by that longing (en Espanol "Anello")that reminds us of our eternality. Shades of George Winston, Bruce Hornsby, and Keith Jarrett. Om Sai Ram, Om Shanti Shanti Shanti. 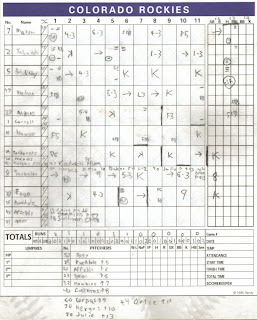 Rockies 9, Padres 8 (13 innings). "And if you believe that, I have some land..."
The entire collective response to the Dodgers season in today's LA Times is one of the most reprehensible and cynical pinwheels I've ever seen. His unequivocal support of General Manager Ned Colletti and Manager Grady Little shows that the jig is up. As I have always suspected, Frank McCourt has virtually no interest in building a winning franchise. His comments are an affront to the great fans of this city and should be taken for what they are worth. He is a liar and a thief. His approval as owner of the Dodgers has ruined this once great organization. He did not even have the decency to apologize to Angelenos for this teams pathetic performance in '07. 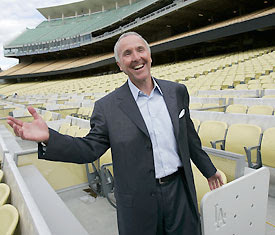 Eventually he will package the entire "Dodgerland" experience and sell it to the highest bidder. Of course the Chicago owned LA Times shrieks of complicity in its lack of scrutiny and analysis of McCourt's end run. The Dodgers are doomed, as are the true fans of the team.